Émilie-Gamelin Park takes on the appearance of an ancestral camp, a place for convergence, meetings and exchanges; just as the Island of Montreal, located in the middle of a great flowing road, was for First Nations. For three days, everyone is welcome to come and rediscover the spirit of the gatherings that marked the seasons of original peoples, during the most luminous summer days. An invitation to make, in a climate of friendship, a journey into the immutable and immemorial time of eternal returns. 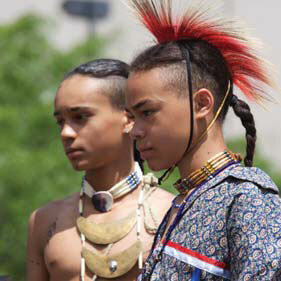 The program includes an exhibit of giant photos, a demonstration of the know-how of sculptors and print-makers from many horizons (including a group of Ma'ohis from French Polynesia); artistic beadwork by Mohawk and Abenaki craftswomen; flintstone cutting by archaeologists who have recaptured the stonecutting skills of ancient Amerindians; afternoons of happiness taking part in traditional songs and dances, including the famous Boréades de la danse Loto-Québec. A range of cultural, museum and community organizations will set up stands. Some new ones in 2009 will be a literature stand from the publishing house Cornac and a display of Sequoia beauty products, from a Kahnawake company. There will be an encounter with Innu culture under the great Shaputuan hosted by ICEM (The Montagnais Cultural and Educational Institute). 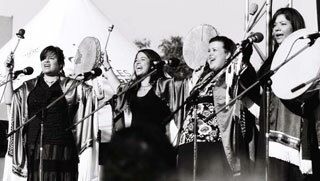 The Rythmes nomades show will weld First Nations rhythms with young voices emerging from Montreal's cultural diversity. The Rez White and Blues show brings Forestare together with Élisapie Isaac and Samian (rumour has it that Richard Séguin will jump on the Loto-Québec stage that evening). On Friday and Saturday, the day will wind up with evening film screenings. In a First Peoples' outlook, stone, wood and bone are not inert materials, but bearers of meaning and memory. An artist who undertakes a work of art enters into a dialogue with the spiritual world, keeping a close relation with all objects of creation. The artistic act comes out of an art of revelation: through the work of expert hands, the hidden face of things comes to life and their spiritual elements become manifest. First Peoples' Festival 2009 invites you to share up close in magic moments when transfigured matter becomes a path towards the world of the invisible. The Émilie Gamelin park site will showcase sculpture and engraving. Hailing from very different lands, the artists' practice retains an intimate affiliation with countless generations of human beings who have drawn soul and survival from generous soil and deep skies. An encounter with the essence of life. In the tradition of First Nations of the Americas, there are no walls separating different artistic pursuits, nor are they ranked in terms of prestige. Building a canoe or a snowshoe is as creative a work as carving a sculpture or embroidering a complex motif. Contemporary artists may still be crafting everyday objects drawn from traditional material culture (paddles, pendants, head-breakers, pipes, knife handles, masks, bowls, walking sticks). Ancestral mythology and daily life continue to inspire them when they take up the creation of original artistic works. Tahatié Montour, Mohawk, Kahnawake (wood); Steve McComber, Mohawk, Kahnawake (stone); Alec Lawson Tuckatuck, Inuk, Kuujjuaraapik (stone); Allan Grégoire, Innu, Mashteuiatsh (stone, bone); Hermel Tremblay, Hermel Tremblay Kakouchac - Montagnais (stone); Denis Charette, Métis/Algonquin, Outaouais (wood); Larry Bélanger, Malécite, Madawaska (stone, metal, wood); Ned Bear, Malécite, Fredericton (wood); Jacques Watso, Abenaki, Odanak (wood); Réjean O'Bomsawin, Abenaki, Odanak (wood, stone); Alexis Normand Weizineau, Algonkin, Abitibi (wood, antler). 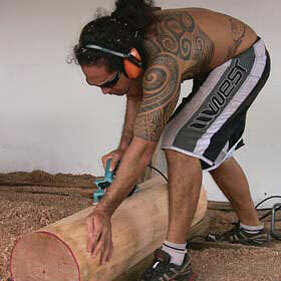 The ti'i ma'ohi is no doubt the equivalent of the totem pole, or totemic mast, among the First Nations. Depicting a divinity or an ancestor made divine, the ti'i (pronounced "tiki") is imposing, pacifying and protective. Its creation requires passion and meticulous work. Seeing artists at work is thrilling. Le Centre des Métiers d'Art de la Polynésie française (CMA) is offering us this opportunity. For the first time on Canadian soil, a delegation made up of some of the most renowned artists from French Polynesia and some of their most talented students will create a large ti'i, as well as engravings on nacre. With its ornamental properties, nacre provides many opportunities for creative work, in particular jewellery. FROM JUNE 19 TO 21, ÉMILIE-GAMELIN PARK, An opportunity for a memorable encounter and an opportunity to observe these artists' creative work close up. The masters: Viri Taimana, CMA director, Jean-Daniel Tokainiua Devatine, Polynesian history and culture professor; Tunuieaaiteatua Salmon, sculpture professor; and Théodore Hopuu, sculpture professor. The students: Tuihani Teissier (from Tahiti); Maili Taora (from Tahiti); Philippe Aukara (from Tahiti), Steeve Terou (from Ra'iatea), Yens Rochette (from Tahiti); and Heimana Tutavae (from Maupiti). The ti'i created by the Ma'ohi sculptors will be officially given to Land InSights as a sign of friendship and solidarity among First Peoples beyond seas and continents, on Saturday June 21 at Émilie-Gamelin park at 3 pm. A unique opportunity to attend demonstrations of stonecutting and other techniques once used by the First Nations of Quebec. Large-scale historical photos from Kanienkehaka Onkwawenna Raotitiohkwa cultural centre in Kahnawake bear witness to the historical and cultural scope of Amerindian presence in the Montreal metropolitan area. From the art of beading to Lacrosse matches, evocative images of the Iroquois cultural universe and its most tangible signs, to which this festival is an heir. On Friday and Saturday, May 19 and 20, after the evening’s musical shows, Place Émilie-Gamelin will become an outdoor cinema. First Nations make moves and movies. In the days of trappers and companies, the story of a man whose peculiar destiny linked his life path to Innu life on the Lower North Shore. Preceded by a selection of shorts by Wapikoni mobile. CE QU'IL FAUT POUR VIVRE (The Necessities of Life) by Benoit Pilon, starring Natar Ungalaaq. An Inuit is exiled for treatment at Quebec City sanatorium. The feature film that triumphed during the Jutra Awards: best actor (Natar Ungalaaq), best screenplay (Bernard Émond) and best film. Canada’s choice for Best Foreign Film entry at the Oscars in 2009. 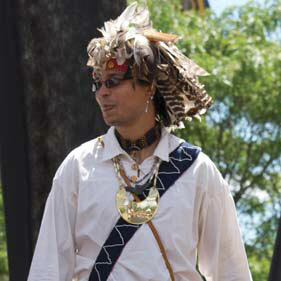 Stéphane Jeannotte, Micmac Nation, songs and humour. IF IT RAINS: The artists will perform at the Agora of UQAM, Judith-Jasmin building, 405 E. St. Catherine St.
Troupes exuberantly and boldly express their pride in sharing their rich dance heritage. 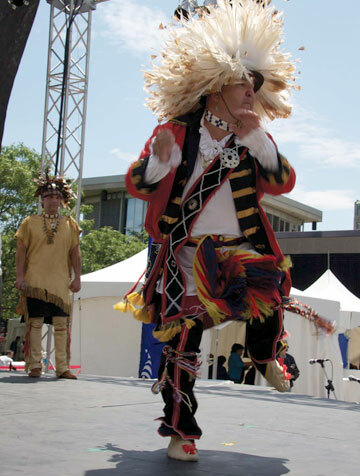 Dancers from the Mohawk, Wendat, Abenaki, Quechua and Maya traditions will perform at the Loto-Québec stage with the spirit and creativity of youth. The fury and at times urgency their choreographies display pay homage to the vital forces that have always marked the passage of humans on earth. Joy alights dancers’ faces; their dance is an offering and its own reward. Following the dance in its finery and fervour is a way of celebrating life. IF IT RAINS: Dance troupes will perform at the Agora of UQAM Judith-Jasmin building, 405 E. St. Catherine St.